Join Bixel Exchange and the L.A. Area Chamber as we discuss the impacts of immigration reform on tech. Immigration is always a hot topic here in Los Angeles and especially in the tech community. With President Trump's recent executive order on H-1B visas, it is even more crucial now to understand the impacts on the changes to the visa and how that will affect technology and innovation. The Chamber's Innovation and Technology Council and Bixel Exchange are proud to partner with FWD.us for our upcoming Innovation and Technology Council to understand what the H-1B visa is, the effects of the President's executive order, and what that means for businesses. Join us and Los Angeles Community College District board trustee Mike Eng as he moderates our panel of experts to help us understand these issues. 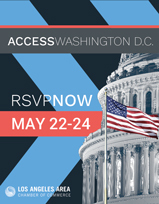 Also, in continuation of our efforts to promote technology and innovation here in Los Angeles, we will be discussing our federal legislative agenda for the Chamber's ACCESS Washington, D.C. advocacy trip set for May 22-24.